Good morning everyone. Welcome to the blog hop and book tour for Tiffany Windsor's Creative Scarves book. 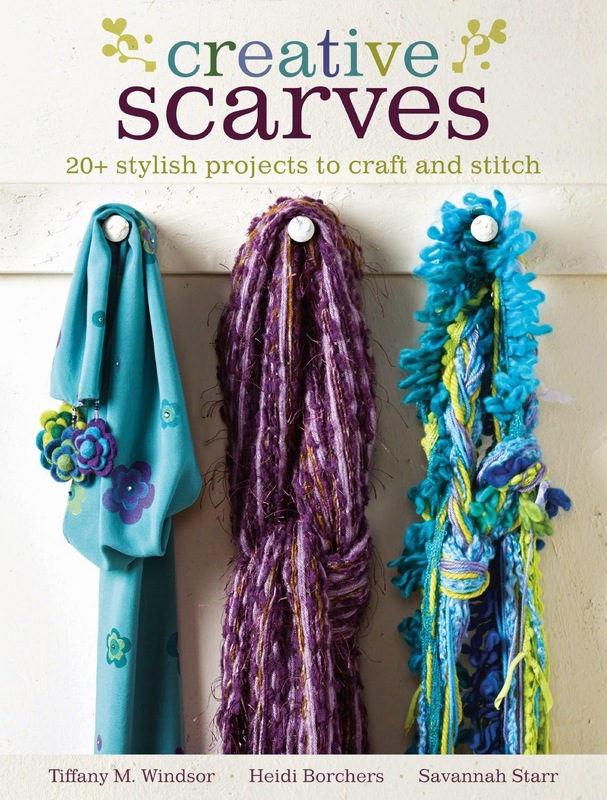 I am thrilled to be involved with a blog hop this week for Tiffany Windsor's Creative Scarves book. I love making scarves so when I was asked if I would be willing to review Tiffany Windsor's newest book, I immediately said yes. I generally crochet scarves, but was intrigued to see other ways to create scarves. This 128 page book is packed with wonderful images and detailed directions for completing each scarf. The photos are amazing and the instructions are detailed, yet easy to follow. The book is broken into 5 sections - Spring, Summer, Autumn, Winter, and Couture - so you can easily search for a scarf based on any requirements you might have. And I was amazed at the variety of projects that used felting, embroidery, stamping, doodling, beading, crochet, painting and so much more. Each time I perused this book, I found something new I wanted to try. I am an avid stamper - I adore my stamps and inks. When I saw the variety of projects using stamps, I knew I wanted to give it a try. I will say that larger, open stamps are better for this project. I found that detailed stamps did not work as well for me (but that's not to say I won't try them again!). I found some pretty silk-type fabric with a slight pattern. Since it was stark white, I soaked it in a mixture of Izink and water overnight. 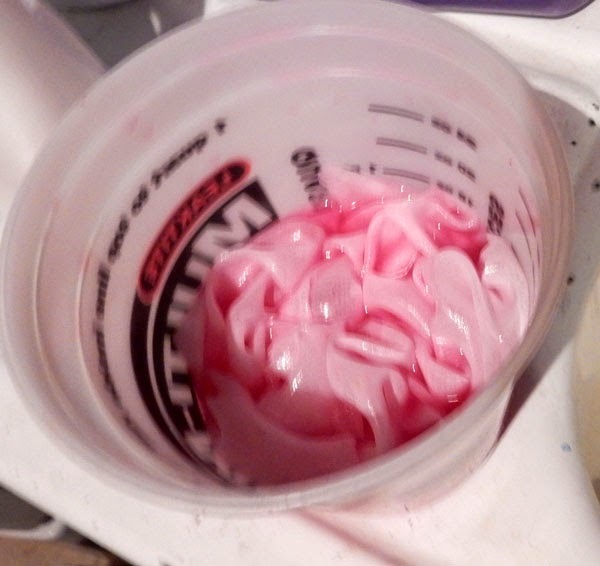 Once dry, this lovely pink tone was the result. I hung it up to dry overnight. Using Deep Woods Crafter's Ink, I stamped the images about the scarf. Just be sure to heat set each stamped image before stamping the next image. 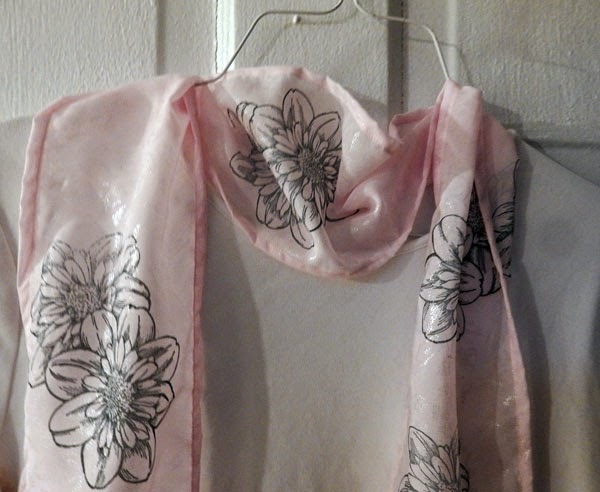 Once I stamped around the scarf, I sewed the edges to finish. I probably should have done that first - but I was just too anxious to start stamping that I didn't think of sewing the edges till I was done! Deep Wood Crafter's Ink is a very dark green and looks really pretty against the pink background. 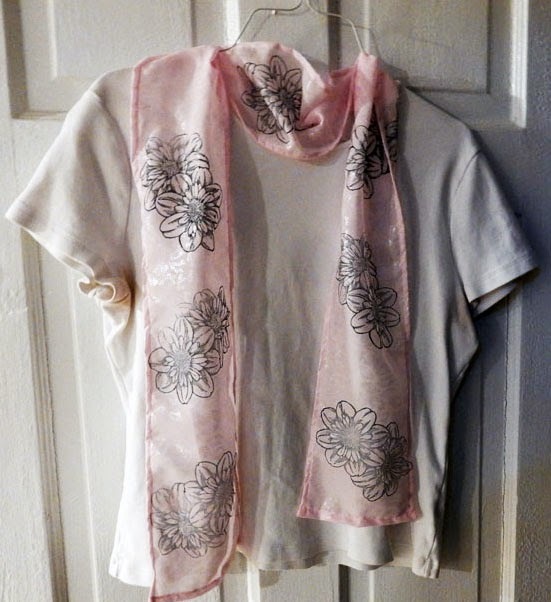 So what do you think of the pink scarf next to my white shirt? It's such a lovely shade of pink and the green flowers really stand out on the background. Reviewing this book has definitely opened my mind to trying something new. I have always wanted to use stamps with fabric, but could never find the time. 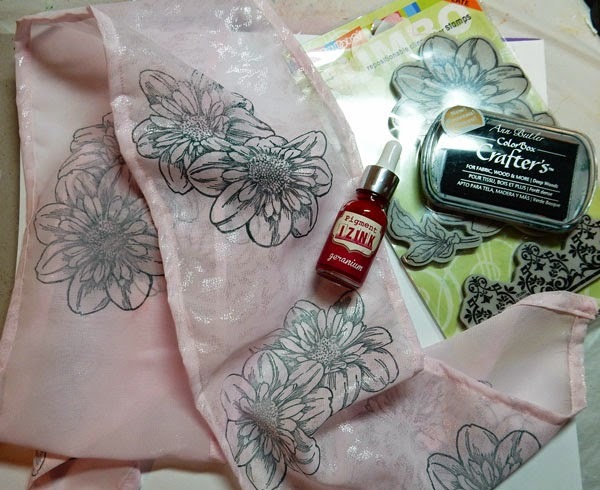 Well, now that I've tried it, I will definitely be using fabric and stamps again. Use the Rafflecopter below for a chance to win a signed copy of the book plus a $100 gift card from Dharma Trading. I am in LOVE with your scarf Steph! 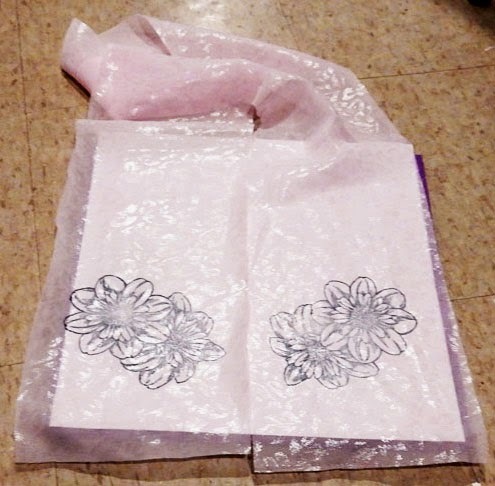 The detail that you achieved with the floral stamp is awesome and it's perfect for spring and summer wear! Thank you so very much for joining in my #creativescarves blog tour and sharing your creativity! Thanks Tiffany. Your book was such an inspiration! Wow - your scarf is gorgeous - perfect stamp image choice, too. Thanks for being part of the tour!